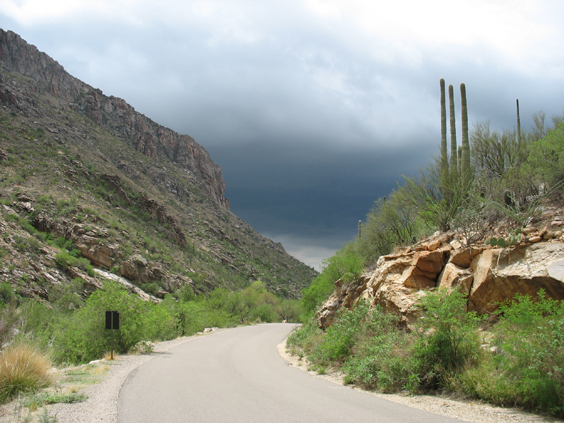 Despite Dennis' back injury, we managed a small hike into Sabino Canyon. With the monsoon now in full swing, we discovered several new pools — and not necessarily where we expected them! This small chute has blossomed into a perfectly smooth water slide. Very gneiss! Dennis gets some free physio in a natural jacuzzi. On the return trip, we noticed a VERY BIG, VERY BLACK CLOUD boiling up the canyon. We made it back to the tram about 60 seconds before the sky opened up, dumping another 2.5" on the Catalina foothills. 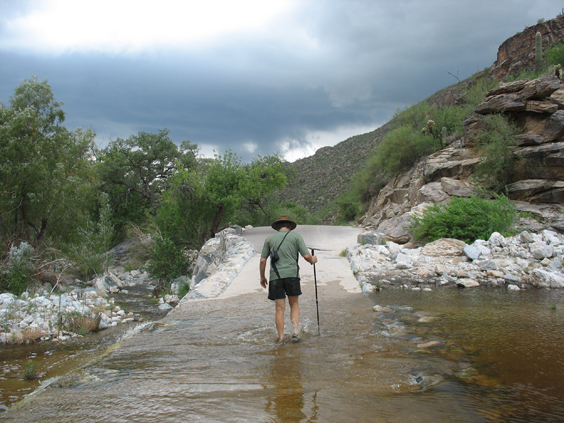 One of Tucson's summertime tourist attractions is watching the Rillito flood below the Campbell Avenue Bat Bridge. This afternoon it rose nearly two feet in 20 minutes.